Reporting on Comments can be created and reviewed to see the and history of comments added to items. More information on comments can be found in the Item Comments Tab topic. Item Types gives the option to filter the Item Comments to specific item types that contain comments. This report filtering option gives the user the option to return report results that contain the keywords entered. The two check boxes below will include or exclude the resulting Comments based on which boxes are selected. 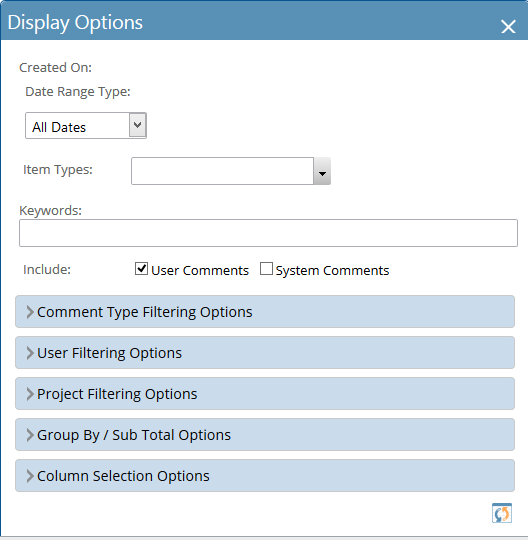 Comment Type Filtering Options are set to filter on different comment types that exist with the item types, such as Project Status, Tasks Status, File Comment, Approval Comment and Issue Resolution. User filtering options are set to filter the Item type based on the Author of the comment or by the resource that created the item type with the comments. See Scheduling Reports via Email, Sharing Reports and Saving Reports.